Is YUMI and MultibootISOs Compatible? Yumi is the Japanese term for a bow, so in English language yumi or Yumi refers more specifically to a traditional Japanese asymmetrical bow, but we are not here talking about yumi or Yumi but YUMI. So as it is, and as you may already have known before now is that, YUMI is a Multiboot Installer that enable it's uses to create a single Installation bootable USB drive which have multiple or more than one OS/Distribution. Thus you can use YUMI to host Windows recovery, Ubuntu, live-booting OS and even the full installation setup file for an OS just as Windows, in just one USB drive. 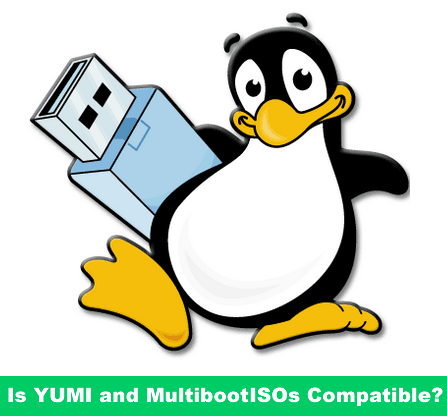 This YUMI Multiboot installation utility is created by the those behind www.pendrivelinux.com and the fact is, because YUMI is is a/the successor of MultibootISOs the important of the question that form the title of this post becomes a necessity. So is YUMI and MultibootISOs compatible? The answer is NO, but the the answer can still be Yes. This is what we mean. As outlined above, YUMI can allow you add multiple IOS setup file to a single Installation bootable USB drive and thus all you need to do is to select the OS you want to install during your computer boot time, and since YUMI is a successor of MultibootISOs, it thus means the MultibootISOs can also be used for this function. So this is why we say that MultibootISOs is not compatible with YUMI. If at the first you have added an IOS setup file to a USB drive using MultibootISOs and now you want to add another IOS setup file to the same USB drive but you want to use YUMI instead, then it will not work. In fact, this is what the developer of the these utilities we are talking about say with regard to this topic, "If MultibootISOs was previously used, you must reformat the drive and start over" because "YUMI uses Syslinux directly, and chainloads to grub only if necessary, so it is not compatible with the older Multiboot ISO tool. Although I do plan to add back most of the capabilities of MultibootISOs as time permits." Why we say that the answer can still be yes the YUMI is compatible with MultibootISOs is the both of them can run simultaneously in the same computer. But the fact still remains, both utilities cannot be use to add multiple IOS setup file to the same USB drive. So in this regard, we say YUMI is not Compatible with MultibootISOs even though the YUMI is the successor of MultibootfISOs. We appreciate your feedback and/or inquiries, so if you have any, use the comment feature below to let us know.